Leaning against the chair at a small glass table in her office, Rabbi Laura Geller exudes the energy of a meditative state. Aided by a stream of afternoon light, she is the picture of equanimity: relaxed, well postured, comfortably adorned in a coral cotton dress that sits pillowy soft on her figure. Her gaze is intense and focused, and she hardly notices when the wind swirls through the room so heavily that it blows the door shut. At her feet, a stack of empty boxes waits. “I’m packing up my office,” Geller, 66, announces. At the end of June, Geller will officially step down from her role as senior rabbi of Temple Emanuel of Beverly Hills, the congregation she has led and served for 22 years. But there is nothing anxious about her mood, despite the fact that the core routines and responsibilities of her life will soon shift considerably, and she will enter a new phase in which the goalposts are less clear. One might expect her to be a bit on edge. Instead, she is looking forward to it. Concluding a two-decade chapter in a four-decade career is worth marking in any profession. But Geller’s departure is even more significant considering the circumstances of her arrival: In 1994, when she was hired as senior rabbi, Geller became the first woman in America to lead a major urban congregation. With only one woman in the country ordained ahead of her — Rabbi Sally Priesand — Geller became the first woman rabbi on the West Coast. Yet she didn’t have a single day of congregational experience before joining Emanuel. Geller’s trajectory was not traditional as either a woman or a rabbi. 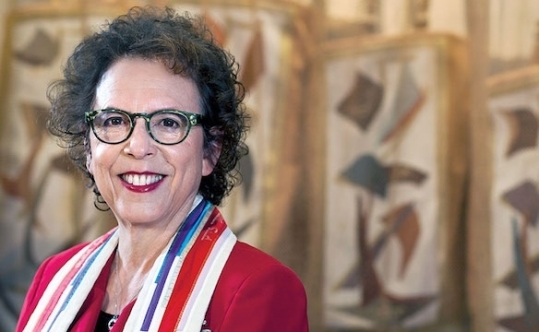 She was ordained in 1976; her first job out of rabbinical school was serving as campus director for USC Hillel — the first female rabbi to do so. “There were leaders in the Reform community who told me I’d be throwing my career away if I went to Hillel,” Geller recalls. At the time, she had no interest in leading a congregation and preferred the path of political action and social justice. After 14 years at Hillel, she became executive director of the American Jewish Congress, but eventually stepped away because she became uncomfortable with its “right-wing” political approach to Israel. Around that same time, Temple Emanuel was seeking a new spiritual leader. “In some significant ways, I was the second woman to pursue a full-time life as a rabbi,” Geller says, looking back. “I’m grateful I wasn’t the first. I came into the rabbinate already a strong feminist, and it might have been more difficult for somebody as outspoken and engaged [as I was] to have been the first. It was easier that someone else had opened the door,” she says of Priesand. Geller has told and retold these stories throughout her career. For better or worse, breaking the gender barrier is part of her legacy, and even though it may have felt limiting at times, she is proud of her contribution to the transformational shift in American Judaism. “When women became rabbis, everything changed,” she says, “because we brought the Torah of our experience to our rabbinates. So liturgy changed, prayer changed, theology changed, scholarship changed, everything changed — including the structures of institutions. Geller also became an activist in the women’s and civil rights movements — and volunteered as a draft counselor during the war in Vietnam. Her immersion in these struggles made her realize she could agitate and advocate from within her community, but first she had to figure out which community that was. “I decided to go to rabbinical school not because I wanted to be a rabbi, but because I wanted to learn how to be Jewish,” she says. Eager to integrate women, Hebrew Union College-Jewish Institute of Religion accepted her into its rabbinic program even with only passable Hebrew and little other Jewish background. “I was like a clean slate,” Geller recalls. Of 50 students, she was the only female. When one day a teacher declared, “There is no important moment in the life of a Jew for which there is no blessing,” Geller had a visceral reaction: There were many moments in the life of a Jewish woman bereft of blessings — among them first menstruation and the onset of menopause; after a miscarriage or an abortion. “That was a moment when the Torah of my life became clear,” Geller says. She would go on to create the blessings and rituals she and other women needed. Because most Jewish communities today lack a holistic mechanism for supporting aging and elder members of the community, Geller has spent the last several years conducting focus groups on what it might look like to create a Jewishly supported system for aging in place. One outgrowth of these conversations is an initiative called “The Synagogue Village,” which recently was awarded a Jewish Community Foundation Cutting Edge grant. Secular models of this concept exist throughout the country, but this will be the first faith-based village; to establish the L.A. pilot, Temple Emanuel partnered with Temple Isaiah and Congregation Kol Ami. Geller also plans to co-write a “how-to” book on aging with her husband, Richard Siegel, as part of her post-pulpit rabbinate. Near the end of our two hours together, the conversation turns toward spirituality. Inner life is something Geller has cultivated with deep interest over the last 15 years, owed in part to her involvement with the Institute for Jewish Spirituality, and it has endowed her with a striking quality of presence, even in casual conversation. “Honestly, I think the point of spiritual practice in general is about paying attention to what is going on right now. And most of us don’t,” she says. “Most of us are asleep all the time. Free of past regrets, unworried about the future – Geller seems more like a Buddhist than a typical Jew.